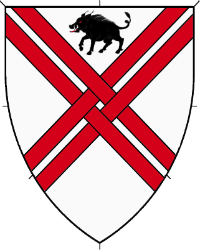 Argent, a saltire parted and fretted gules and in chief a boar statant sable. Name registered with the College of Arms in October 1992. Device registered with the College of Arms in January 2016.